This is the second illustration by Hannah Ensor of Stickman Communications for +Black, for others in the series see +Black Illustrated. 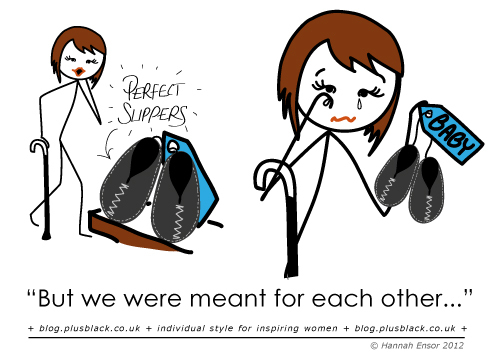 It is inspired by ‘Love these felt slippers’ where I bemoan my experiences in finding the perfect pair of slippers and discovering that they are only available in baby sizes. Discussing my ideas for +Black, the issues around footwear are many and varied. Bespoke footwear made by orthotic and other specialist footwear makers seems to be, in general, expensive and lacking in any kind of style aesthetic. Mass market product, available for those with more common foot problems, is poorly made, uses inferior materials and is considered, in general, to be ugly. I suspect there is no real win-win with this as both the individual nature of foot problems combined with unique individual style likes/dislikes ensures that it will be difficult to fit/please everyone. Nevertheless, my gut – not, I have to say, a hugely reliable tool – tells me there must be a middle ground of fit/style/price improvement that would work for most of us. At home with Habibe – plus size or no?